Mr Squishy loves Thomas the Tank Engine and has been enjoying watching Thomas go on his various adventures on the tv. Having seen this I did attempt to take him on the tube once thinking he would love it but boy was I wrong. He started screaming hysterically but then he is still quite young and had never been on public transport except when he was still in my tummy. For now we will have to make do with him playing with toy trains for a little while longer as I am not sure he is quite so ready to try again just yet and neither am I. Instead he is happy watching trains whizz by on the tracks from a safe distance and also watching them on tv and of course his favourite of all, playing with them. Until recently Mr Squishy only had one Thomas toy and a book that plays the theme tune but recently this lucky little chap was sent a Glowing Musical Thomas toy from Golden Bear Toys to review. Once my little man saw what was in the box when the package arrived he was extremely excited and grabbed it out himself. He is getting to know the routine now so he ran off into the room we often do the children’s reviews, sat down and started saying deeeeee (his version of cheese) with the most enormous grin on his face. Now from past experience I know the best way to show others how much a child really likes / loves a toy is to video them with the item. Anyone can pose for photos with a product and smile saying the kids like it and move on, well I simply can’t do that as I like to be thorough as you may have realised by now so naturally we did a video just to show how much this toy is loved. As you can see this is a great toy for any Thomas fan. The funnel at the top (black) plays various phrases when pressed and the dome (blue) plays the Thomas the Tank Engine theme tune. The cheeks light up and change colour and the toy itself is very cuddly and soft. The music can be turned off so that this toy can be taken to bed without the fear of it waking the little one at night. There is also a James and Percy option too which is handy to know as many little ones would love to have the whole set. This is a great toy for encouraging imaginative play in little ones and my little man loves singing along to the song each time he presses the button. 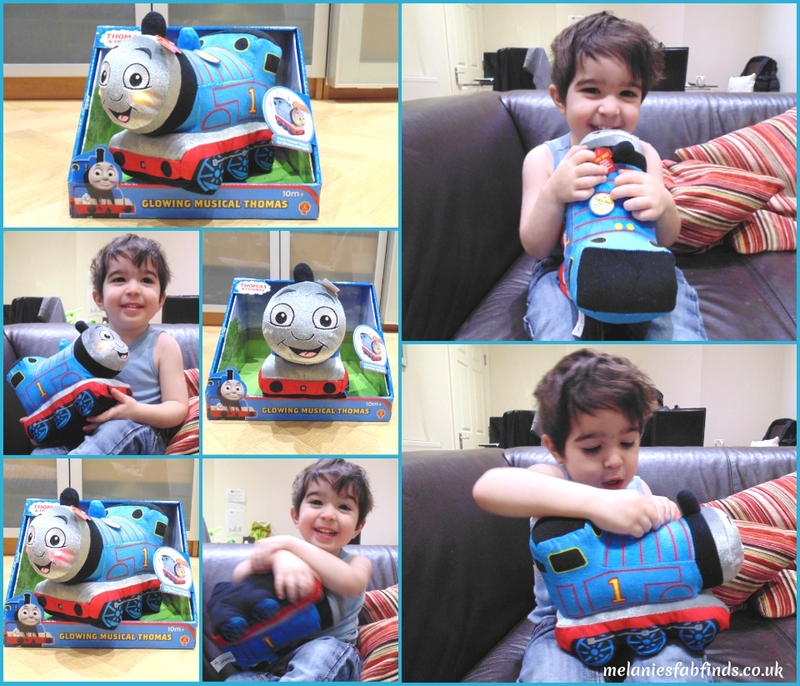 Doesn’t this look like a great toy for all little ones that love Thomas? It makes a great gift for a toddler at any time of year. Mr Squishy is loving it and would love one of you guys to win one for your own little Squishy so we are holding a competition for one lucky reader to win one. We are a family that love Thomas the Tank Engine, Wonderful prize.